As 2010 slowly sinks into the sunset, it’s time to close the book on some athletes. Jack Nicklaus won 18 professional majors. Tiger Woods has 14. And that's exactly how that career race is going to finish. By that I mean there are a few guys whom, if we never heard from or about again, it would not leave a giant chasm in the sports universe. In fact, it might leave some room for a handful of up-and-comers to finally get their due. For these guys, the time has come and, more importantly, pretty much gone. And we’ll start with a player who’s dominated golf headlines for over a decade. TIGER WOODS – I am so done with him it’s not even funny. We’re talking about a guy who hasn’t won a major championship in two-and-a-half years! Yet, just today, I saw something about him losing another of his major sponsors. Why would any self-respecting sports’ fan care? The media needs to realize that all love affairs, based on performance, are doomed to end. When Woods burst on the scene with a hole-in-one at his first PGA TOUR event (1996 Greater Milwaukee Open), he was everything to every man. Young. Good looking. A sensational player for his age. Frankly, he’s none of those things now. 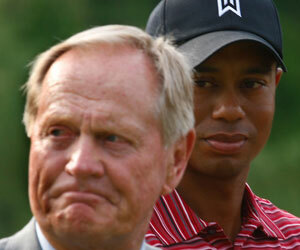 On his own website, he has an image of him looking over Jack Nicklaus’ shoulder. Give me a break. How full of yourself can someone be? And I haven’t even mentioned the debacle that’s his personal life. BRETT FAVRE – Before this season began, I was an advocate of Favre being able to play as long as he thought possible. Now, even he knows that train has reached the station. The problem with Favre is that we’re no longer talking about his playing. We’re being forced to endure stories about his alleged dalliances while playing with the New York Jets. The circus-like ending to his consecutive-starts streak. And then, to top it all off, selling special footballs after the streak ended. When you were a football player, Brett, we were interested. But, clearly, you’re not anymore. So long. LeBRON JAMES – When this mouthpiece wins even one championship, maybe I’ll be interested. I still cannot believe the hoopla that surrounded his departure from Cleveland for Miami. What an amateur this guy is. He cares about one thing – LeBron. I’m not saying he shouldn’t have left Ohio but, for God sakes, have some class and manners about it. Show your home state some respect. As it stands now, James’ Heat sit second in the NBA’s Eastern Conference with 23 wins in 32 games. Call me when they’ve beaten the Celtics and Lakers in the playoffs. Maybe then I’ll be interested in anything LeMouth has to say. ALEX OVECHKIN – Seems he’s developed Alexei Kovalev disease. It’s a horrible affliction. Only affects guys with tons of talent who turn it on and off like a faucet. They only play hard when they want to. Yet, in Ovechkin’s case, we’re continually stuck with hearing how great he is. Right now, Sidney Crosby is making a mockery out of any Crosby v. Ovechkin comparisons. After failing to win the Cup again this year, wouldn’t surprise me to see him tuck his tail between his legs and head back to the motherland. Yes, yes, yes and yes. And as I responded to one of your earlier pieces, add Don Cherry to that list–in fact put him at the top. Actually, I thought Don Cherry was a gimme, so I didn’t even include him.